Of Me, Myself and I: Pineapple tarts! Preheat oven 160 degree Celsius. 1. Cream softened butter, icing sugar and salt. Add vanilla essence and mix well. 2. Add in egg yolk one at a time and mix well. 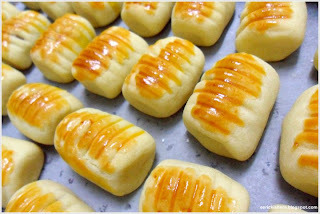 Ta-da~ There you have it, a very nice dough for the pineapple tart. And now for the pineapple jam..well I usually buy the pineapple jam from those baking shops. Or if you like, you can cook them yourselves as you might find those pre-packed ones are a li~ttle too sweet for your liking. Next, we wrap the dough around the jam. The jam I usually scoop into small small balls (or according to your preference), then wrap the jam with the dough. And oh, while wrapping the jam with the dough, I normally wrap it with just sufficient dough to cover up the jam as some would complain that there's too little jam in the tart (oh well). Then, I use one of those sticks (I don't know how to say it, it's like a rolling pin, but it's made of plastic and has rings all over it, for shaping) to give them the lines as you can see from the picture. BAKE! For 15 minutes or so, or until you see the egg yolk turning golden brown. So...yeah. I'm a beginner at baking, hope you find this recipe simple enough to follow!